The kneejoint or articulatio genus is the biggest and most complicated synovial joint in the human body. It’s formed by the distal end of the femur and the proximal end of the tibia. Between these two, the medial and lateral meniscus are located. The anterior part of the femur (facies patellaris femoris) articulates with the patella which forms the patellofemoral joint. The cruciate ligaments, situated in the intercondylair space, and the collateral ligaments are important ligaments in the knee. The anterior cruciate ligament (ACL) joins the area intercondylaris anterior with the medial aspect of the lateral condyle. This ligament extends upwards, dorsally and laterally from the tibial plateau. It prevents the tibia from moving ventrally. The PCL is stronger than the ACL. Both cruciate ligaments run in a torsion. They stabilize the knee in the sagittal plane. When the knee is in endorotation, the cruciate ligaments are strongly crossed. When in exorotation, they run more parallel. The cruciate ligaments are primarily located in the posterior part of the joint capsule, so the flexion and extension aren’t hampered. The purpose of this test is to detect anterolateral rotary instability of the knee. The structures that could be compromised if this test is positive are the ACL, LCL, posterolateral capsule, arcuate complex and ITB. The patient lies supine with legs relaxed. The examiner grasps the heel of the involved leg with examiners opposite hand placed laterally on the proximal tibia just distal to the knee. The examiner then applies a valgus stress and an axial load while internally rotating the tibia as the knee is moved into flexion from a fully extended position. A positive test is indicated by subluxation of the tibia while the femur rotates externally followed by a reduction of the tibia at 30-40 degrees of flexion. Is the pivot shift test a reliable test? For the pivot shift test, the examiner applies with one hand an axial and valgus load. This hand is also going to control the rotational position of the tibia during the test. With the other hand, the foot is held firmly against the examiner. The results of the pivot shift test are different according to the rotation. Grade I pivot shift: When the tibia is held in maximal medial rotation, there is an abnormal movement that can be felt as a small and gentle sliding reduction. This does not occur in neutral or lateral rotation. A comment here is that it’s barely palpable when the patient is awake but more obvious when he’s under general anaesthesia. A grade I knee is the result of residual laxity or partial cruciate injury. The result is an instability wich is mainly anterolateral. Grade II pivot shift: There is a definite ‘clunk’ when the tibia is in the medially rotated position and there is an abnormal movement in the neutral position. The test is negative when the tibia is held in a position of definite lateral rotation. Because of the clunk and the abnormal movement in neutral position, the difference between grade I and grade II can be detected. In a grade II knee is a more obvious anterior instability, due to a non- functioning ACL. This grade of pivot shift is seen after a fresh ‘isolated’ rupture of the anterior cruciate restraints and in chronic instability of moderate degree. Grade III pivot shift: When the tibia is held in neutral or moderate lateral rotation, an abnormal movement with a pronounced clunk takes place. The tibia can follow its path to maximal anterior laxity. Due to gravity, the femur falls posteriorly and the tibia is located in an anteriorly translated position with a lateral rotation. With a medial rotation the shift is less obvious. With an acute injured knee with moderate to severe damage of the posteromedial and posterolateral structures, including a complete anterior cruciate rupture, we find a grade III pivot shift. This is also the case when the knee has a severe chronic instability and consequent stretching of the secondary posterior restraints. Table 1. shows the displacement of the medial and lateral plateau of the knee, comparing different grades of severity of an injured knee in accordance with the pivot shift test. The advantage of repeating the test in different positions of rotation is that it gives a more accurate and reproducible way to quantify the test, unlike the subjective estimation of severity. But the downside of this method is that it is not completely objective because the examiner must decide whether or not there is a positive pivot shift test. Except for grade III, there is an important positive difference in accuracy of the test when the estimation is done under anaesthesia. Even under anaesthesia it may be difficult to differentiate grades II and III. Such cases should be treated as grade II. 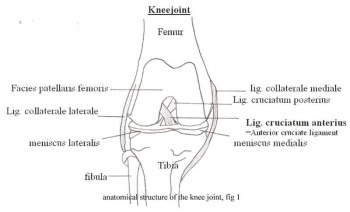 The anterior cruciate ligament is already non-functional from grade II. The difference between grade II and III is that when you have got a grade III, there is additional laxity on both medial and lateral sides. This involves secondary limitation in the posteromedial and posterolateral corners togheter with the purely lateral and medial structures. The Lachman test can be executed on a painful knee. This is not the case for the pivot shift test. ↑ Schünke M., Schulte E., Schumacher U., Voll M., Wesker K., Anatomische atlas Prometheus, Algemene anatomie en bewegingsapparaat. Onderste extemiteit: Botten, banden en gewrichten. Houten, 2008.p394, 396. ↑ Kapandji IA. Bewegingsleer, de onderste extremiteit deel 2. De functie van de kruisbanden. Houten, 2009. p135. ↑ Baxter R. Pocket guide to musculoskeletal assessment, second edition. Elsevier Science 2003. ↑ Lane CG, Warren R, Pearl AD. The pivot shift. J Am Acad Orthop Surg. 2008 Dec;16(12):679-88. ↑ Lopomo N, Zaffagnini N, Bignozzi S, Visani A, Marcacci M. Pivot Shift Test: Analysis and Quantification of Knee Laxity Parameters using a Navigaion System. J Orthop Res. 2009 July 29. ↑ Katz JW, Fingeroth RJ. The Diagnostic Accuracy of Ruptures of the Anterior Cruciate Ligament comparing the Lachman Test, the Anterior Drawer Sign, and the Pivot Shift Test in Acute and Chronic Knee Injuries. Am J Sports Med. 1986 Jan-Feb;14(1): 88-91.